*** Via HIRA's Facebook page yesterday, HIRA received an incredibly insightful and devastatingly pointed essay yesterday from a wise conservative Republican on Maui, Mr. Richard Kalama . The paragraphs below represent essential reading for anyone who cares about the future of our troubled Hawaii GOP and for anyone who holds out hope of Republicans being the majority political party in the islands. if not all of their lives , have believed everyone is a Democrat . . . It's not hard to understand how one might think this, after all. Hawaii truly has been essentially a one-party state for over 5 decades. What amazes me the most is that nearly everyone I talk to agrees Hawaii is messed up. It is one of the most beautiful places on earth. But for those of us who are not tourists coming to spend a week or two, but actual residents that have to live here , our list of gripes is long: Taxes through the roof, a cost of living that really is far higher than it needs to be, an educational system that year after year ranks lower than almost any other state. Every politician in the state, from county council to Governor, talks about "affordable housing". Yet the only ones that can afford a home here are millionaires from the mainland, or families willing to spend the rest of their lives working 3 jobs and renting out rooms, eating beans and rice, just to pay the mortgage. Yet we all wonder why so many people are moving away. Our second amendment rights here in Hawaii are not a right, not even a privilege. Your chances of winning the mega jackpot lotto 10 times in a row are better then your chances of ever even seeing what a concealed carry permit looks like. Yet hundreds, if not thousands, of criminals walk the street with guns. I'm sure we all have things to add to this list. But the bottom line is simple: The Democrats' own responsibility for these problems is theirs 100% . With 50 plus years of control in a one party state, we should expect a virtual utopia. What I could never understand, until now, is WHY the Republicans haven't capitalized on these facts. It would seem that anyone with even a 5th grade education would be able to articulate the potential of conservatism. The Democrats should be the easiest people to defeat in an election right? Well no, actually. And the reason is this . . . 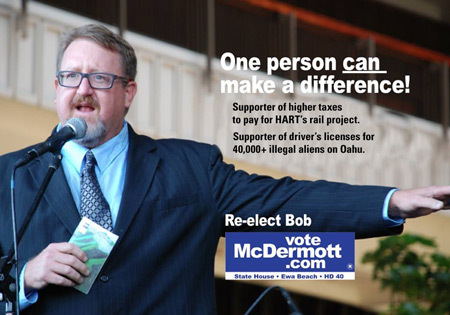 The Republican Party of Hawaii is a complete joke -- from the top down. Fritz Rohlfing who should be the fearless general in our battle, has proven to absolutely incompetent. I don't believe he is even worthy to be called a RINO. He is in all actuality a Democrat, or at least a wanna be. On a more local scale, here in Maui for instance, the Republican Party of Maui has dubbed itself a social club. Our meetings are spent talking story, talking long drawn out stories with no solutions at all. My wife and I got involved about a year ago, we wanted to be more than just voters. We wanted to be foot soldiers in the battle to make Hawaii Red -- not just for this election, but forever. We never looked for titles, we looked for direction. We already have far too many chiefs and not nearly enough Indians. Well, we wanted to be Indians. I am sure General Custer would have loved fighting here rather than at Little Big Horn. If he had, he would have surely won. As Republicans, we have no fighting spirit anymore. We are content eating the scraps off the tables of the Democrats, when we should be eating the banquet. Hawaii is ripe for the picking. Hawaii needs conservative values in its leaders. 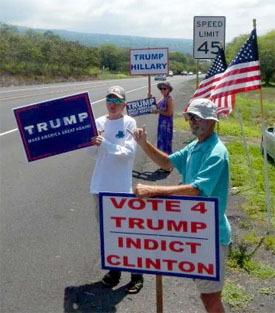 Hawaii needs a party willing to stand up to the Democrats and say with a resounding yell: GAME OVER!! But until we fix our party leadership, until we stop thinking like losers, until we can stand tall and say "YES. I'M A REPUBLICAN", we will truly be nothing more than a social club . Shame on The Party, shame on its leaders. It's time for people to say enough! HIRA thanks you for speaking truth to power. We cannot disagree with a single word you wrote. Indeed, all of us at HIRA hope that others will find your words as inspiring a message as we do. When this General Election is pau, it will be time for a serious and very thorough housecleaning at the Hawaii GOP. Thanks again for saying what we are all thinking! Contact office manager Keith Rollman at 586-9730 or k.rollman@capitol.hawaii.gov for more information. *** Retaining this seat is important for the GOP for several reasons. Tupola is the alternative to the current minority leader and party-switcher-in-waiting Beth Fukumoto. To learn more about the liberal Fukumoto and her likely future as a Democrat, read Bob McDermott's warning to Republicans . Tupola would likely become the GOP leader in the state house once Fukumoto switches parties. Another reason this race is important is because Democrats and unions are pushing hard for Tupola's Democrat opponent. They are trying to unseat Republican Tupola with the help of Charles Djou's former staffers and campaign aides, whom HIRA recently profiled in a recent " Infiltration Alert ". 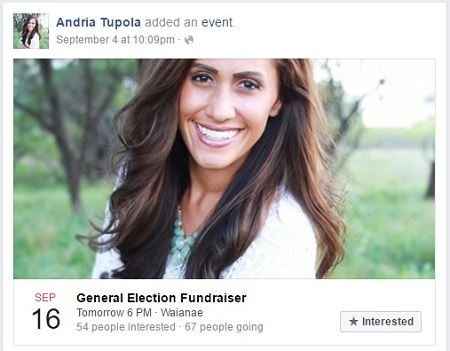 To learn more about Andria Tupola, you can tune in to PBS show "Island Insights" tonight at 8:30pm when Tupola will face off against Democrat Stacelynn Eli. You can also visit Tupola's website and Facebook page . The Trump campaign will meet in the parking lot of Walgreen's and Ross' fronting Walmart on Kanoelehua. There's plenty of parking so, no need to worry about that! We will be standing on the long stretch of the grass area to hold up our Trump signs, banners, our American flags, and wearing the biggest smile imaginable. 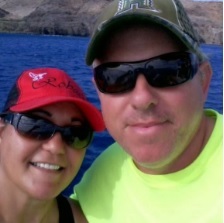 She's an experienced, second time GOP candidate running for the State House of Representatives District 16, which includes the island of Niihau and the communities of Lehua, Koloa, Waimea on Kauai. 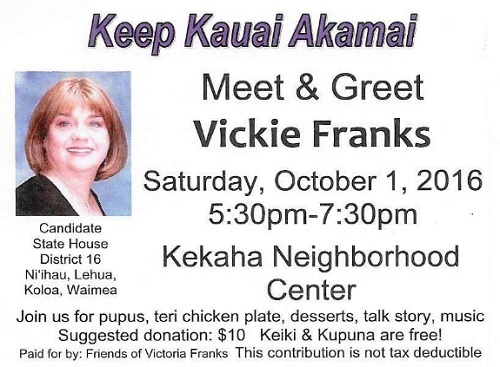 Ms. Franks is seeking to unseat longtime Democrat and HGEA union activist Dee Morikawa. Ms. Franks's campaign could also use your help with an ambitious schedule of canvassing and signwaving from now to Election Day. Please contact Carol Tokuuke for more info at ctokuuke@yahoo.com. Learn more about Vickie Franks from her website , her Facebook page , and this recent newspaper story .